Permission to Break the Rules, Sir! If you have stopped by my “About” page, you know that I have creative ADD. I think many creative spirits have a need for ohhhhh, shiny glitter. Where’s my coffee? The question is, how many unfinished projects do you have? After the traditional crayons, I spent many years learning the “rules” of good creative process. It started with photography and I learned composition and the rule of thirds early in my life as a photographer for the junior high yearbook. And yes, I learned how to photograph with film. It was this flimsy stuff that I had to stand in a dark room and process. In fact, you had to transfer it by hand in a pitch black room from the camera to a special spool lest you lost all of your photos to the light. Then, by magic of chemical processes, images would appear on special paper over time. It was amazing and I loved it. Shortly thereafter, I took high school art. I was the pits. I learned a lot of different techniques but nothing of note or remembrance other than my art teacher let me know that I could not draw. It’s funny how those little statements stick with us in our creative journey. Sketching and shading eluded me in their drawn sense and my teacher made that obvious to me. As a biology major, I dabbled again in photography and even took a commercial design class. I know my roommates thought I was nuts, staying up late, attempting to sketch and then color in with special expensive markers. My teacher saw my concepts and my colors and ignored the fact that I traced many elements, since I could not draw, and gave me positive feedback. It was fun. After graduate school, I found myself with free time as my friends had more traditional hours with their jobs and I found myself out of work often at 3. So I took a class at the local recreation center and tried watercolor and oil painting. There, from the same teacher, I learned about color… how to mix color, how to use color, how to see color in a different way. But I could not draw, so I did not like what I made ultimately. One marriage and 3 children later, I discovered digital scrapbooking. There was no mess involved and it used skills that I had and required that I learn some new ones. Composition, photography, color… and Photoshop or Photoshop Elements. I grabbed the 30 day free trial and a few free kits from around the web and was off and scrapbooking. 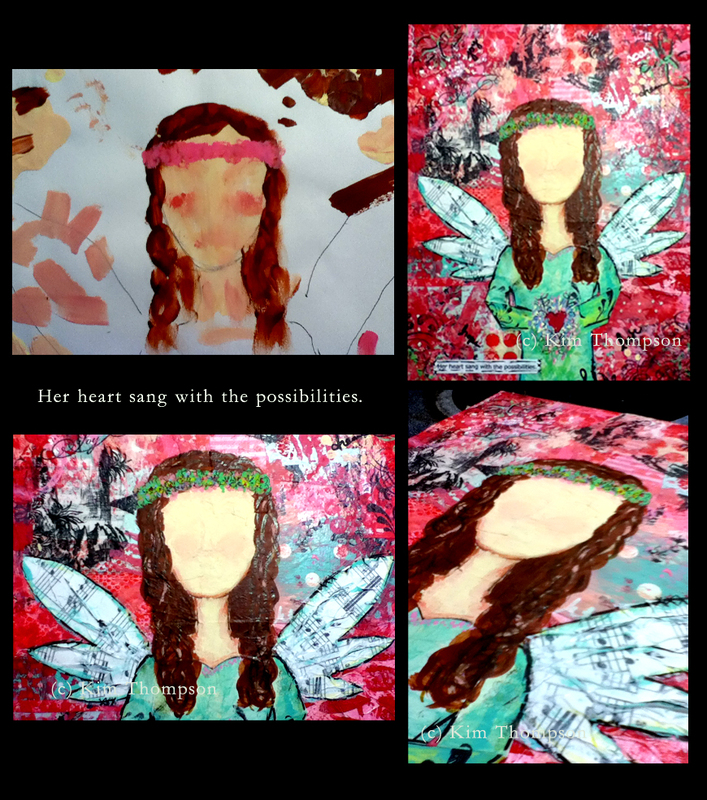 About 2 years ago, after kiddo number 4 was not attached to my hip, I came across a term I had not heard of before… mixed media art. Being the consummate googler that I am, I linked here and there and everywhere and discovered something that said “Go ahead! You want it in your art? Then put it in your art!” Fibers, glue, wax, ceramic, metal, oil paint, watercolor paint, marker, paper, tissue, cardboard… its all fair game. Ultimately, I found some videos of Christy Tomlinson creating. It was instantly liberating. She uses her fingers and she was not exacting and she sincerely takes delight in her process. She uses all of the rules I had learned about… composition and color, lines and shading but she throws out the rules in her execution to some degree. She follows her heart in her process. Yet again, I was off… and learning more… only this time… I was learning to break the rules. Funny, as a tried and true rule follower, I needed that permission to do so in creating. So, regardless of the negative voices in your head, telling you that you can’t do this creatively or you are not good at that creatively, learn the rules and then revel in breaking them. I give you permission!